Johnson's Prussia Norway, Sweden and Denmark. 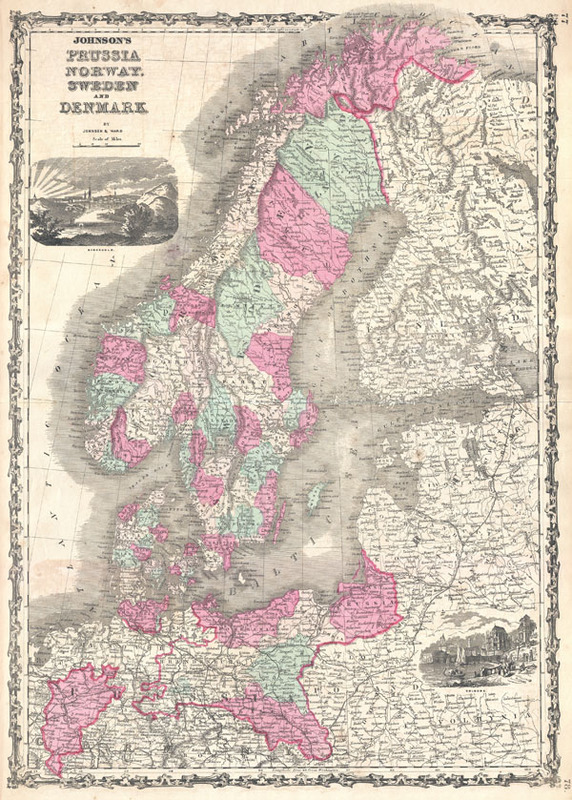 A stunning example of the 1862 Johnson and Ward map of Scandinavia. Includes Norway, Sweden, Denmark and Prussia. Also includes most, and in some cases all, of Finland, Poland, Estonia, Latvia, Lithuania, and parts of western Russia, though they are not the direct focus of the map. An engraved view in the upper left quadrant, just below the title, depicts Stockholm. Another view, in the lower right quadrant shows a daily scene in Cologne. Prepared by Johnson and Ward as plate nos. 77 and 78 for inclusion in the 1862 edition of Johnson's Atlas. Rumsey 2905.044 (1860 edition). Phillips (Atlases) 6140.